Meghan Trainor is one of the music industry’s biggest young stars. At only 23 years of age, she already has multiple multi-platinum #1 hits, and a Grammy for Best New Artist to her name. She achieved incredibly massive mainstream success in 2014 with her singles “All About That Bass” and “Lips Are Movin”. Her music harkens back to a simpler time, with her doo-wop inspired harmonies and 1950’s aesthetic. This made her a perfect choice to create the theme song for 2015’s The Peanuts Movie, “Better When I’m Dancin’”. 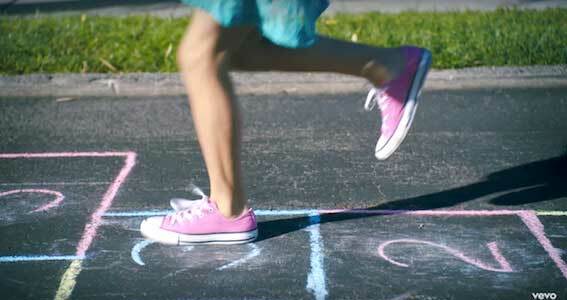 This little girl plays hopscotch in pink chucks. The song is heavily influenced rhythmically from soca style Caribbean music, while Trainor’s vocal harmonies are very reminiscent of old doo-wop and soul music. The lyrics are all about how dancing makes everything in the world seem right, that you can dance your way through any problem. While that’s not necessarily true, it’s a nice sentiment and it fits with the groovy Caribbean beat. This beat also marks a departure from Trainor’s other work up to this point, and is a bit of a surprise considering her usual 1950’s sound is a seemingly no brainer for a film about Peanuts. However, this combination of music and lyrics work really well, and it’s easy to see why they chose this route. Meghan and her backup dancers go for a retro look. The music video starts out in black and white, highlighting the nostalgia of the times that Peanuts originated in. Throughout the video, Meghan Trainor and others dance in the streets, in fields, and in a diner to really hammer home the whole “nothing’s better than dancing” sentiment. A cool effect used is the way the Peanuts characters are inserted into the video to dance along with the real people. 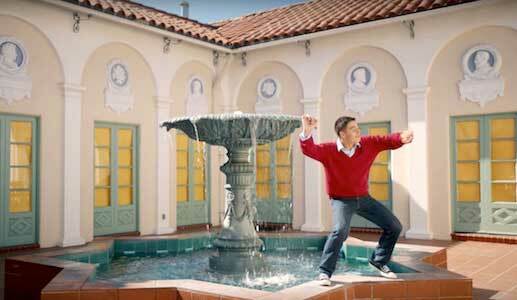 Since the video is going for a vintage look, it’s no surprise that there are plenty of people wearing chucks. Meghan’s backup dancers wear white chucks to match with their waiter uniforms, a little girl plays hopscotch in a pink pair, and a young man dances on a water fountain wearing classic black. The song and video is very reminiscent of other theme songs from animated movies such as Justin Timberlake’s “Can’t Stop The Feeling” and Pharrell’s “appy”, which doesn’t necessarily make it original. That said, it’s a fine song that fits the film well, and really that’s all you can ask from a theme. Everything is better when you’re dancing!